Arturia recently released the second version of their Spark software, Spark 2, for “premiere beat creation”. With the first version of Spark being quite a hit, the name had a lot to live up to this time around. But would it live up to that name? Upon opening Spark 2 it became apparent just how intense the software is. I even got the “pinwheel” of death for a few seconds while it started up, something that rarely happens to me using any other plugin. Once it did open up, I was greeted with a user-friendly interface that, while a little intimidating, looked exciting to learn how to use. The main window is, as the name suggests, where much of the programming is going to happen. What I like about the main window is that it allows you to access the beat, pattern, sequence, tune and song that you’re using at that point in time, meaning you can program everything without leaving that main window. This is especially handy when you’re performing in real time, but it also means that it’s just easy to use when you’re in the studio. You can also use the “Live FX” pad and effects buttons to change the sounds in real time. Once you change to the sequencer window, you get a little more control over your sequences, with a layout of each sample being used and exactly what beats it’s being used on. It’s nothing special as far as step sequencers go, but that exactly what was needed, and it’s nice to get a little easier to use sequencer than the one in the main window. The “Song” tab also is quite intuitive, and offers an easy way for users to organize their songs. All it requires is for users to drag and drop patterns in the order that they want. Next up is the “Studio” tab, which is where you edit samples. Spark 2 comes with a number of great effects that users can add to your samples to achieve the sound that you want to achieve. The next tab is the “Modular” tab. 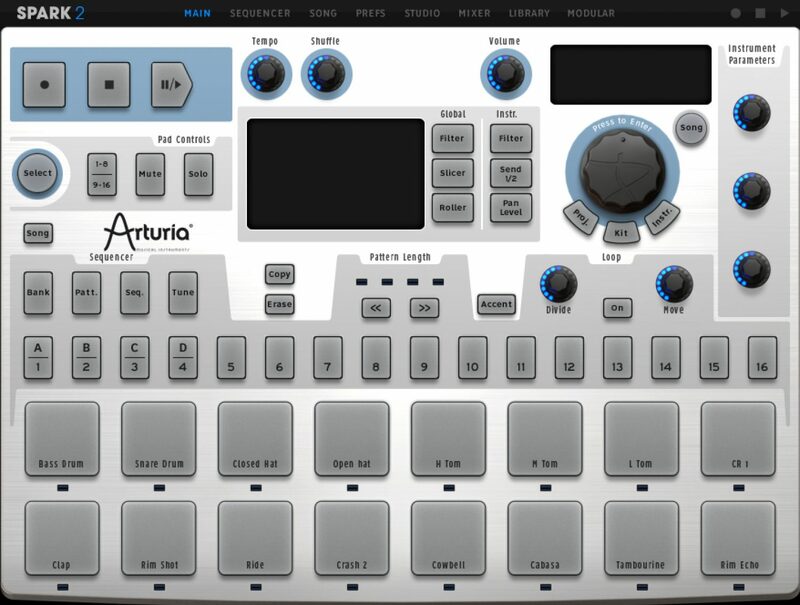 This is a very nice addition from Arturia, and offers a number of great features. It allows users to edit existing patches, and even create their own patches. The software includes a number of great modules, including a Karplus Strong module, among oscillators, filters, envelopes, and everything else that you would expect from a modular synthesizer. The “Mixer” and “Library” tabs are exactly what you’d expect, with the mixer tab offering a good amount of control over your samples, and another place for you to insert effects on them. One of the great things about the Spark 2 is the library that comes with it, which is pretty extensive. Just be playing around with the sound that come with it, you can tell that Arturia has covered all the bases as far as different styles goes. Arturia’s Spark 2 is quite complex, and as such there is a little bit of a learning curve when you first use it. After that, however, the software becomes quite intuitive and is extremely powerful. After using it a little, Spark 2 starts to require less effort to use, allowing for maximum creativity. Coupled with the extremely extensive library, and you have some very powerful software.